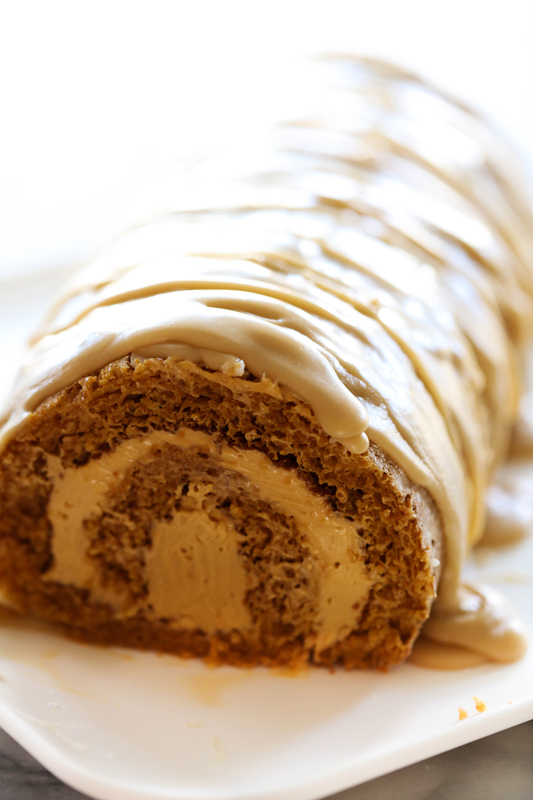 This Caramel Pumpkin Cake Roll is such a moist and delicious cake with a rich caramel cream cheese filling. It is topped with an incredible caramel frosting that is the perfect finishing touch. The holiday season is in full swing and I am trying to stay afloat with all the to-do lists. Dessert is one thing that cheers me up when my days seem to be getting the better of me. I am so excited to share this crowd-pleasing mouth-watering recipe with you today! Caramel and pumpkin are two flavors that go so well together. 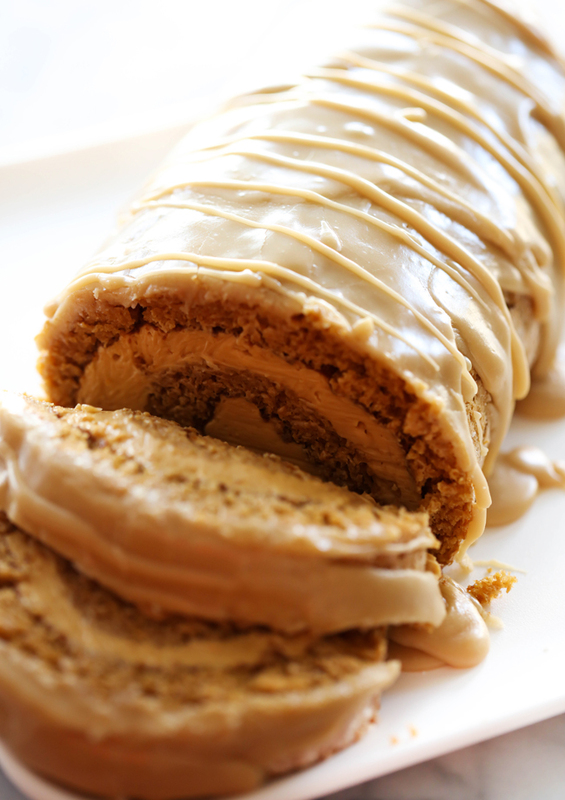 I decided to give my Perfect Pumpkin Roll a facelift and add in some Dulce de Leche and caramel. It turned out absolutely delightful! Everyone who tried this raved about it. The pairing of soft pumpkin cake with rich creamy dulce de leche filling is a match made in heaven. The caramel frosting on top is one of my favorite frostings of all time. Its flavor and texture are so wonderful. Line a 15x10 inch baking pan with parchment paper. Grease and flour the pan and the top of the paper. In a large bowl, beat egg yolks until think. Gradually add ½ cup sugar and the pumpkin. Beat mixture until the sugar is almost dissolved. In a smaller bowl, beat egg whites until soft peaks form. Gradually add remaining sugar and beat until stiff peaks form. Fold the egg whites into the pumpkin mixture. In a smaller bowl, sift together flour, baking soda, cinnamon, and salt. Gently fold into pumpkin mixture. Spread into pan. Bake at 375 degrees F for 13 to 15 minutes, or until cake springs back when touched. Cool 5 minutes and turn cake onto a kitchen towel sprinkled with powder sugar. Gently peel off paper. Roll up cake in in the towel starting with the shorter side. Cool completely before adding the filling. In small bowl beat cream cheese, Dulce De Leche, powdered sugar, vanilla and salt until smooth. Unroll cake and spread filling evenly. Roll up again and place in the refrigerator while making the frosting. Combine butter, cream and brown sugar in medium sauce pan. Stir over medium heat until mixture begins to boil. Remove from heat and add powdered sugar and vanilla and mix well. Spread over cake.